Union Urban Development Minister M. Venakaiah Naidu today launched free to use ‘Smart Toilets’ set up by the New Delhi Municipal Council (NDMC) under public private partnership (PPP) model at National Gallery of Art on Shershah Road, opposite Haryana Bhawan on Copernicus Marg and near Tolstoy Marg Metro Station. Each such complex has one WC toilet seat and four urinals for men, one WC each for women and differently abled, water ATM, bank ATM and digital health centres. He also launched one ‘Reverse Vendor Machine’ set up by the NDMC at gate number two, Palika Market. 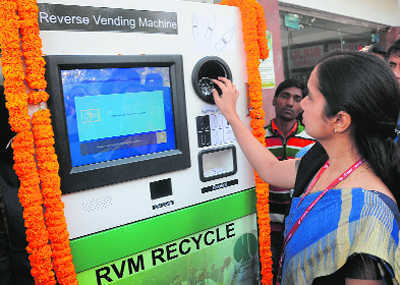 When a plastic bottle is dropped into the machine, it gives a receipt of credit of up to one rupee. NDMC is setting up 20 such machines which help in preventing littering of plastic bottles. Speaking about the progress of Swachh Bharat Mission in urban areas since its launch in October 2014, Naidu said the mission picked up momentum during 2016 with 502 cities and towns, including New Delhi Municipal Council, declaring themselves ‘Open Defecation Free’. Another 237 cities and towns are set to become ODF by March. The minister further informed that 95 waste to compost plants are currently functional in the country with an annual production of compost of 2.88 lakh tonnes. Delhi is producing the highest quantity of compost of 3,000 MT per month followed by UP-2,900 MT per month.